June 29, 2010  Gen. David Petraeus testified before the Senate Armed Services Committee on Tuesday. He has been picked to be the top commander for the war in Afghanistan, and if confirmed by the Senate, will inherit a challenging mission -- and a tight deadline to achieve it. June 29, 2010  Gen. David Petraeus, nominated to serve as the top commander in Afghanistan, appears before the Senate Armed Services committee Tuesday. While Petraeus is expected to be confirmed easily, Senators are predicted to press him on whether President Obama's strategy for the war in Afghanistan is working. June 25, 2010  Two days after President Obama replaced Gen. Stanley McChrystal, the U.S. commander of the war in Afghanistan, with Gen. David Petraeus, the focus now is on how to move forward with the war strategy that depends on military officers and their civilian partners working together. June 23, 2010  President Obama on Wednesday accepted the resignation of the top military commander in Afghanistan. Gen. Stanley McChrystal stepped down after he and his aides were quoted making disparaging remarks about the president's national security team. The president has selected Gen. David Petraeus to replace him. June 22, 2010  The top U.S. commander in Afghanistan, Gen. Stanley McChrystal, has been ordered to attend the monthly White House meeting on Afghanistan and Pakistan in person Wednesday. He and his aides are quoted in a Rolling Stone article making disparaging comments about top Obama administration officials. June 22, 2010  The top U.S. commander in Afghanistan, Gen. Stanley McChrystal, has been summoned to Washington, D.C., to explain his controversial comments about colleagues in a recent interview to Rolling Stone magazine. June 11, 2010  Defense Secretary Robert Gates is wrapping up a 10-day trip around the globe. 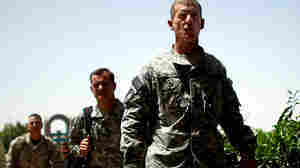 He reassured some allies about the value of their contribution to the Afghan war -- while pressuring others to do more. Gates said he needs to see progress in the war by the end of the year. June 10, 2010  Secretary of Defense Robert Gates is in Europe this week pressuring NATO allies to send more troops to Afghanistan as the U.S. builds up its forces there. Gen. Stanley McChrystal, commander of U.S. and NATO forces in Afghanistan, said the Kandahar operation that is supposed to be getting under way this month is moving more slowly than expected.